Ronnie Smith fought as right-handed southpaw whose love of boxing kept him hooked for over half a century. A prolific amateur throughout the sixties, he boxed for London eight times, the first of which took him to Uganda. He also represented England eight times, including appearances in Russia, West Germany and Italy. 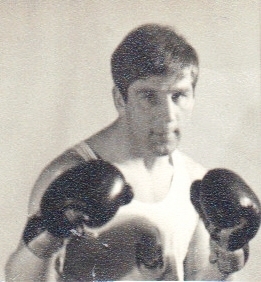 As Ronnie grew from light-welter to light-middle, he won the North West London divisional championships five times in a row and the London finals twice. There were a tough bunch of contemporaries on the prowl at the time, including Bunny Sterling, Howard Sharpe and Mark Rowe, all of whom he beat, although Mark Rowe repaid the compliment in their next fight, which turned out to be Ronnie’s last. At the age of 25, he became a trainer at St Pancras ABC, where he remained for 45 years and produced a string of champions. 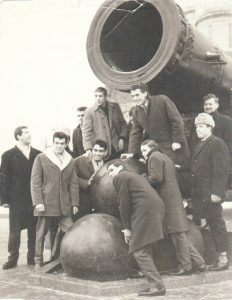 England Team in Red Square, Moscow – Ronnie’s hand is on Larry O’Connell’s shoulder. 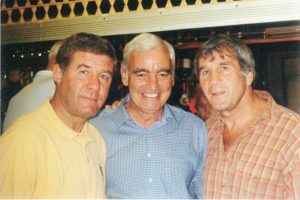 Mark Rowe, Larry O’Connell and Ronnie Smith. Love Ronnie. Excellent trainer, and fighter before that. I still see Ronnie occasionally in the Holloway Road. Sorry to know that he he’s been diagnosed and being treated for Parkinson’s. A great guy, and I’ll never forget the times I trained with him.